We reached the end of our summer countdown over the weekend, opening our last envelope on N.'s birthday. Today, O. started kindergarten, making the beginning of a new school year official, and signalling the start to many new things in our Small World. I look at pictures of the two of them on these milestone days, and can hardly believe how much they've changed during these long summer months. It was a glorious summer, full of all kinds of fun adventures and discoveries, and I hope we'll always be able to look back on it as a marvelous lead-up to New Baby joining our family. I thought one way to really remember who my children were during this summer before they became the oldest in the family would be to celebrate all the things they've learned to do since summer began. Get his own drinks using plastic cups from the cupboard and the water and ice in the door feature of our refrigerator. Blow up a balloon by himself. Buckle himself into his booster seat in the third row of the mini-van. He is so proud he gets to sit back there by himself. "Mom, will I always get to sit in this seat, even after I'm a grown-up?" Ride a two-wheeled bike with training wheels. Swim across the pool on his own. Dive to the bottom of the pool. Recognize all of his letters, and is able to write a word if you spell it aloud to him. Illustrate whole books of animal filled scenes and other landscapes. Judging from his dancing at my cousin's wedding, apparently taught himself the entire catalog of break dance moves from 1985, including a handstand flip and backspin. Change outfits five times a day. Jump off the diving board at the lake without anyone catching her (wearing her life jacket). Get popsicles from the freezer. Appropriate use of the phrase "What the Heck?" Open every childproof locking drawer and cabinet in the house. Sleep in a big girl bed. How to throw a full on three year old girl fit, complete with screaming, pushing hair back off of forehead, and pummeling of her brother if need be. Rhapsodize about the various attributes of princesses and ponies. Laugh her head off at potty jokes. Refuse to sit in a booster seat at mealtimes. Is it really possible there's so much more change awaiting us this month? I am thrilled to discover who these two amazing kids are going to become as part of a family of five, and simply cannot wait to meet the spectacular person that is working on becoming their brother. For now, I'm glad I get to take a moment to savor the fantastic people they are right now. N., my Birthday Mermaid, with her new Ariel loot. I barely recognize her. Is it possible she changed OVERNIGHT? 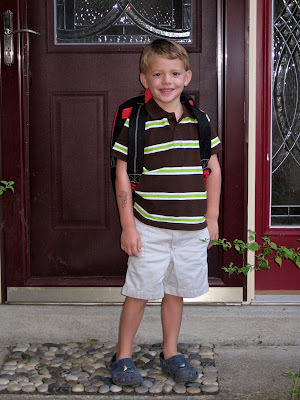 Classic first day of school pose. Can you believe how eager he looks? when I dropped him off at preschool? away from me with him. *Perhaps you remember that I haven't always had the best of luck with birthday cakes. This would be Mermaid Cake #2, after the dog ate nearly half of the first one the night before N.'s party and I had to remake the WHOLE THING. Perhaps I'll learn not to make them the day before??? I adore this post! They look so big! 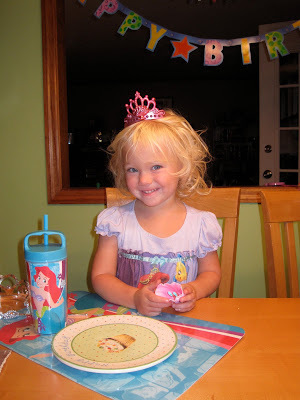 Isabel had an Ariel party when she turned four (did I already tell you this?). Something about that little mermaid, isn't there? I love how ecstatic O looks with her cake. And WHERE did you get that shell plate?! Perfect! Where did all of N's hair come from? She was practically bald like two weeks ago. Look at those amazingly adorable blond curls! She's a beauty! I'm so excited for you as you step into this next phase. All good things. Your already beautiful mermaid princess gets more beautiful each time you post a new photo -- plus, she just looks so happy! And so grown up! Her list of accomplishments made me chuckle. 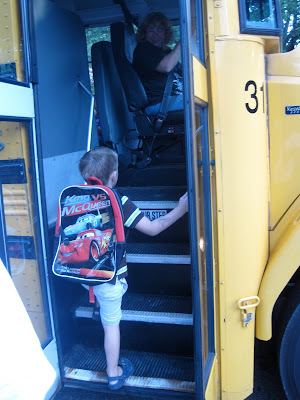 I'm trying to imagine how it felt to watch O. step onto that school bus. Wow. I'm so excited to hear more about kindergarten. Fantastic cake, by the way. I'm so happy you are helping us to remember all the new and wonderful things that happened this summer. We can't wait to meet the newest "Small" one. The caption under O. 's picture brought tears.